The match consists of 10 scenario stages, plus a warm up stage. The scenario stages are made up of five courses of fire, first shot in the dark and then in the light. Minor modifications are done to the stages between the dark and light runs. At this match, dark means no light, not low light. IDPA rules require that flashlights be hand held, not pistol-mounted. All of the stages were challenging and quite a bit of fun. Some offered unique tests, in addition to the whole "in the dark" thing. The course of fire descriptions are uploaded here for reference. "Alley Oops" started with the gun loaded with just six rounds. Spare loading devices were placed in a grocery bag, which also held a five pound bag of flour. The bag, and our flashlight (for the dark stage,) was held in the support hand. The "puzzle" was to figure how to manage the flashlight, and get the magazines out of the bag after dropping it. At the start of the lights out run, I dropped the mag, switched the flashlight in my strong side hand and used it to retrieve and stow the magazines from the bag. 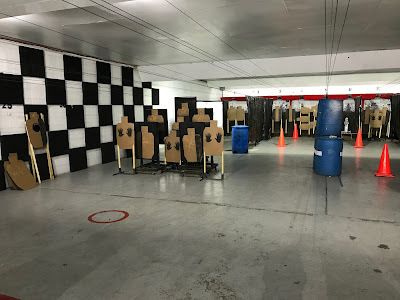 Then, switching the light back to my support hand, engaged the first target with the required six rounds, and reloaded on the move to the next target shooting position. That was entirely too many moves. In the next, lights on, run, I started by setting the bag down, rather than dropping it. That left my magazines on top of the bag of flour where I had placed them. I then engaged the initial target. After shooting the first target, I grabbed the two magazines at once, stowing just one and reloading with the other. That seemed to work a bit better, and meant less juggling of items. 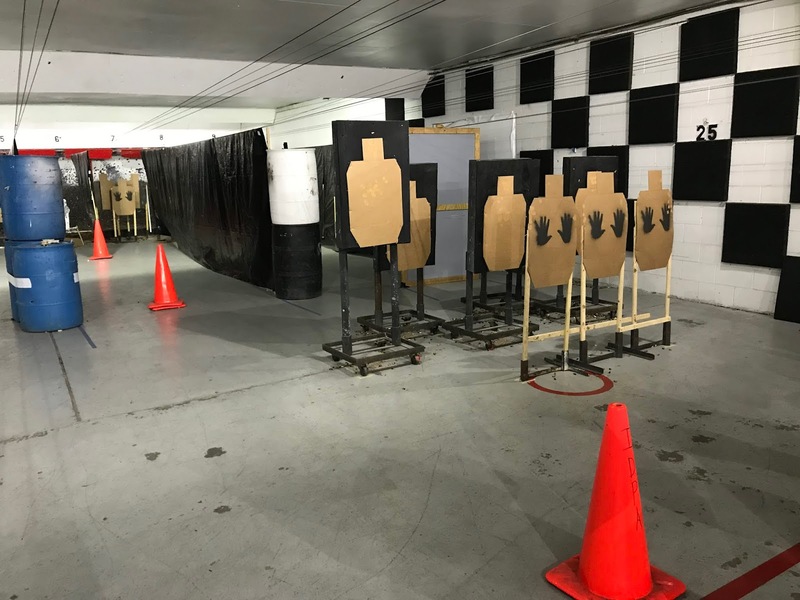 The starting position for another stage pair, "Shotgun Went Boom," was holding a shotgun, shouldered and aimed at a cone down range. For the first run, the flashlight was held also in the support hand. At the beep we placed the shotgun in a barrel and moved up range to cover, from where we engaged a round steel target through the -0 zone of a standard IDPA target. Any hits outside of the steel were considered misses. The added challenge to this stage was that hits on the steel did not make the usual "ping" sound confirming a hit. In the dark run, the smoke from my pistol all but obscured the steel. The lighted run of this stage was my best finish of the match. "Well Guarded Hostages" was the Standards stage of the match. Five threat targets were fronted by two non-threats. The height of the targets varied, and the non-threats allowed only a few inches clear on some of the targets. The dark version required simply two body and one head on each. Things got a little more complicated when the lights came on. The two body and one head requirement was joined with, "Each threat must be engaged with 1 shot each freestyle, strong hand only, and weak hand only. Shooter may choose what order to shoot each style (free / strong / weak) but once a style is started, shooters must finish all shots of that style before switching to the next style)." There was a quite a variety of executions observed for this one. Shooting all eleven staes took just four hours, as the match is exrtemely well-organized. On our travel home, we stopped to enjoy a delicious BBQ dinner, adding to the fun of the day. Despite the initial nerves, once shooting started I felt surprisingly relaxed. I felt no pressure to repeat my performance from last year, and simply allowed myself to enjoy being there. Surprisingly, I shot most of the stages better in the dark than in the lighted versions. Overall, I did not shoot anywhere near as well as I hoped. That was both disappointing and frustrating. I did however, enjoy myself immensely. That's the important part. I'm looking forward to next year, and being in continued good health, AND getting in more practice prior to the match.